Privacy is something nearly everyone cares about, but in the digital world it can be very difficult to control information. News of new data breaches and hacks seem to be coming in every day. Customer credit cards, celebrity photos, and confidential corporate emails have leaked out into the public domain. Unfortunately, once a leak occurs it can’t be undone and the damage — financially, personally, and professionally — can be significant. To help combat these issues, EveryBit has been working hard developing solutions which anyone can use. So how do you prevent hackers from exposing your private data? Encryption. How can you use encryption in one simple step? Use I.CX. I.CX can help you maintain digital privacy at home and at work. Anytime you send a message or file, use I.CX to encrypt your information before it leaves your web browser. Your message or file is only decrypted once it reaches your designated recipient. Simply go I.CX, choose a username and password, and you can immediately begin sending encrypted content. For additional security, add a free end-to-end encrypted contact on your website. To use the secure form, visit the I.CX form generator page and copy a single line of code to your website. This will display a contact form which encrypts all information before leaving the web browser and delivers it to your I.CX inbox. You can choose to have email notifications when a new message arrives. 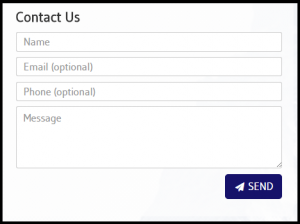 The encrypted contact form from I.CX is a very easy way to let your visitors communicate with you in a secure way. Get your own form at I.CX today.